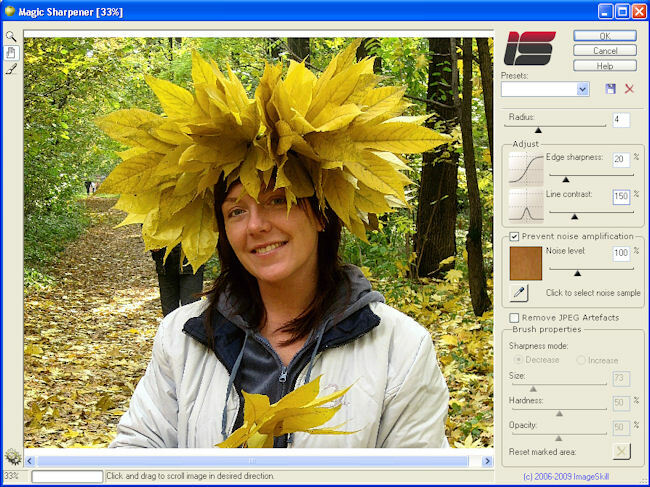 ImageSkill Software has updated of ImageSkill Magic Sharpener plug-in v.1.5 for Windows. It returns a user feeling of reality and breathes new life into your photo without color halos and increased color noise and JPEG artifacts. Plug-in increases the contrast along edges and gets more sharpness and contrast to fine details making them more visible. The latter features can be managed independently doing sharpness enhancement to be content-sensitive in some sense. Since sharpness increasing is very creative process when one is trying to satisfy its own demands that in general contradict each other the separate processing of edges and fine details give everyone unbelievably easy way to realize his own flight of fancy. It is the main feature that differs this plug-in from other (Nik Sharpening, Focus Magic etc). Magic Sharpener processes RGB and Grayscale images with 8 or 16/bits channel. Plug-in has simple install and de-install procedures and automatically detects suitable graphics hosts. Demonstrations of the plugin's features are available in ImageSkill online Tutorial. ImageSkill Magic Sharpener is compatible with Adobe Photoshop and Photoshop Elements, Macromedia Fireworks, Corel (Jasc) Paint Shop Pro, Corel Painter, Corel Photo-Paint and Microsoft Digital Image Suite. ImageSkill Magic Sharpener runs on Microsoft Windows 98/ME/2000/2004/XP/NT3/NT4. The full version of ImageSkill Magic Sharpener is available in English for $29.95 including VAT, downloadable from http://www.imageskill.com. Just now, we upgrade our products for registered customer free of charge. NOTE TO EDITORS: A free registration key for a review is available upon request. Contact Dmitry Chernichenko at DChernichenko@imageskill.com for more information or to request a registration key.